Back once more into the fray of gaming! If its not already apparent we are jumping onto the armament argument. This has at least always been hinted at with many feminist arguments against primarily fantasy worlds in general. While this plays off as a defending vidya argument, it can be used on the whole for any situation of women and armor in fantasy works. We all know this argument though, “why all the battle bikinis with men in full suits of armor and what not? That’s not practical or realistic!” Well here I plan on not only showing examples of what’s really standard in video games, but compare this to real world warriors. Also I’m going to go into the tactics of what is more ideal for a combat situation. Would lack of weighty armor be a risky thing? With this in mind Let’s Hammer This In! Before we go into ‘why’ the armor is different, we might want some examples. For this I think we need the two most prominent examples of fantasy armor in video games today, the Elder Scrolls series and Dragon Age series. Both of these games predate the major feminist push in gaming so obviously there should be so much in the name of ‘problems’ with them, right? So how about Skyrim? What do we get? Well since this is a 6 year old game overall its not hard to find video of the armor. But from my knowledge in playing this game when there is very revealing armor for women its just as revealing for men. So to call the argument ‘disingenuous’ in relation to Elder Scrolls is an understatement. In Dragon Age you have a little more of an argument from later DLC, which is something I find hilarious because its supposed to be the more ‘progressive’ game. But for the most part is still fairly reasonable when it comes to the core armor types. However, I know a lot may refer to Ivy Valentine or some other characters from Japanese developed games for their argument. I didn’t say that the ‘battle bikini’ didn’t exist at all, what I showed is for the most part newer games worked past it for ‘normal’ women. Ivy isn’t in that category because she is an immortal alchemist bound to a mystical demon sword. People might also link Morrigan from the Dark Stalkers series. This is extremely disingenuous. As she is a literal succubus, sexual appeal is one of her natural weapons. Overall though, some of the better female specific armors you may find in games tend to be lighter on both defensive power and weight. If you think about it as a matter of physics and biology this actually works better. Now as for why this actually works better. For this I’m referencing a journal that uses 41 different sources showing that women are in general more agile and dexterous than men. The prime idea is as follows from this: Due to the additional flexibility and nimble movement the not so extreme muscles supply on an athletic female, while the man could take more damage and stay standing a woman would have a better chance of dodging the attack altogether. Now with the way many RPGs are I can’t prove this concept of observation in an actual game. Too many variables exist in most of them, variables that can be changed back and forth artificially to be definitive. I wouldn’t want to be seen as disingenuous now would I? That’s why I would like for this part to be the comment part for this time around, if you have a favorite RPG series or other series that displays this concept. So lets think about this logically. If you are able to jump, dodge, and roll more easily then what do you want to be wearing, a heavy and clunky suit of armor that will weigh you down and restrict your wide range of movement? Or would you rather be wearing something light, open, and gives you that won’t get in the way of your ability to dodge then strike like a viper? I think the strategic worth is obvious. Now what have we figured out here? We figured out for starters that it seems overall that the idea of the ‘battle bikini’ is mostly connected to myth in video games. Even where it does show up it actually makes logical sense for it to occur due to biological facts about sexual dimorphism and athleticism. It would make sense for a woman to be wearing lighter armors that do not hinder their movement. However, I will admit that most feminists will probably ignore this argument outright because they do not get along with the science of biology. People such as Milo Stewart and Justin “Riley” Denis are key examples of this factor. Now you do have at your disposal not only a recent study but a solid argument extrapolated from said study for the sake of defending character design aesthetics. That is if you want something more than just “Why do you even care? Not everything has to be for you!” This should be enough of an argument for anyone, but we know better when it comes to debating against social justice advocates. With all this settled, next week I’m going to approach something a little more serious, something meant primarily for parents but would be useful for just about everyone. I’d appreciate any who read my articles to try to spread next week’s as far and wide as you can. I’d like it if we could get all this out there farther. That’s because while I get silly at times a lot of the articles posted on here are issues that do need to be talked about seriously. Until next week, please remember to Game Freely! I’m afraid that’s not how real life medieval combat works. At all. First, because there’s no jumping, dodging or rolling away from attacks as a matter of general strategy. It will help in a pinch, but controlling range via footwork and tempo works better, is more reliable, is more reactive, and doesn’t tire you as much. Which isn’t to say that it doesn’t hamper you, but it honestly has more to do with endurance than speed, and agility such mentioned in the article simply is a non-issue. This article is not about HEMA or traditional combat. This is about how sexual dimorphism can and does justify different builds of armor. Most suits of armor are built to fit the specific wearer back in the day. It was very expensive and was not worn by women because despite attempts to rewrite history heavy armor was never really worn by women. 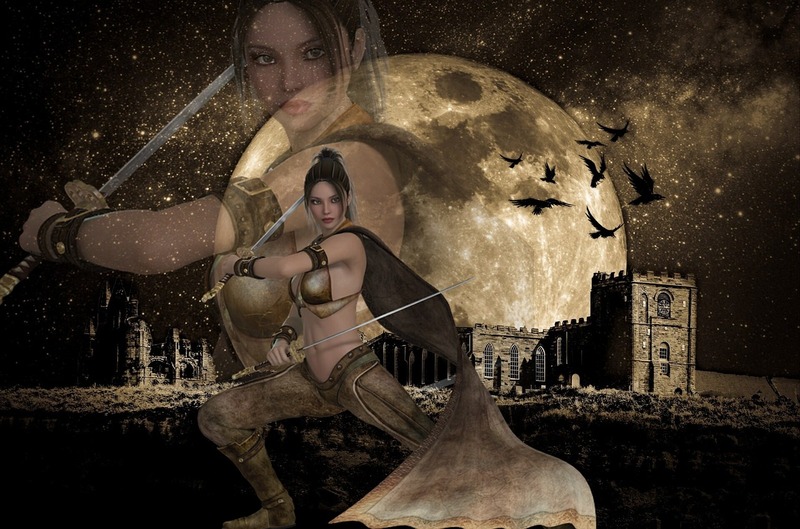 See some of the examples in my prior articles on female warriors in non Western countries. Funny enough after this article was posted Hannah Wallen and I were discussing the whole ridiculousness of the complaints towards battle bikinis with a good question. How much of the body does a Ring of Protection +5 cover? Previous Previous post: Breaking the Narrative Episode 30: Hail to the Chief. Top 10 Democratically Elected Female Government Heads! Next Next post: Women’s march: #ButItsAboutEquality!